What the hell? Is it some kind of creature with it's claw holding on to some kind of egg? Actually, it's a fancy gourd. A few years ago I found these wacky, wacky looking gourds and thought they would be great to put out around the house for the fall season. They are all twisted, almost evil looking. Some have "warts" all over them and most of them are very phallic. 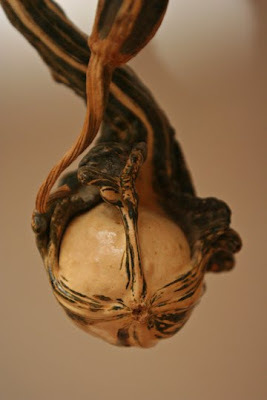 Below is a photo of the seasonal altar where this gourd is hanging. 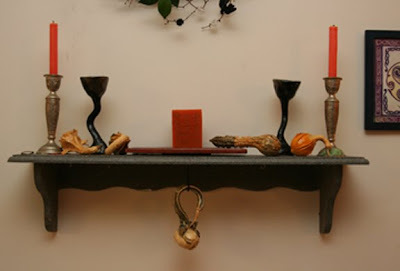 There are some other gourds on the altar. Notice the big phallic one to the right.